Bishop's yarn in Chatsworth, CA is going to have a HUGE yarn sale this coming week - they have already put out the yarn and it's ready to go - they open on Tuesday at 10AM - I think they're selling all the "fun fur/funny/railroad, etc." 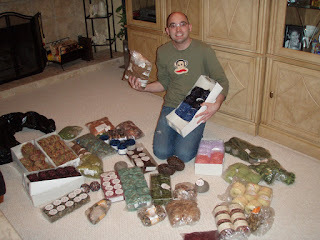 yarn for $2 a ball - on Thursday the actual sale hits, and they'll be selling it all for $1 a ball!!!!) - I'll be there on Saturday to help out, but I did my pre-purchasing today while we set everything up - it's an amazing opportunity for those of us who like novelty yarns (even to bulk up our stashes) - for charity knitting, scarves, hats, baby things, whatever... I love Florence - bless her heart, she has thousands of balls of this specialty/novelty yarn - and even when ALL of the sale yarn is gone, the store is well overstocked! This sale, should all the yarn go, will help to clean up the store - getting rid of lots of the piles of yarn that are on top of the bookcases. The girls also suprised me - when I came in on Saturday to knit, they had thrown out all the spinning pattern racks and put the patterns in those cardboard holders for magazines! it opened up a TON of space - maybe we can put some club chairs or a love seat and a couple comfy chairs there - with a few tables - it'd be neat to have a "living room" type arrangement - to sit around and knit! We are also thinking (kind of) about buying the store. Florence did mention that she was considering selling the business - owning a yarn shop sounds neat to me and I'm all about buying giftware and merchandising - we have a few people interested in going in on it with us; but we have lots to think about before we make a decision.